Description: Canadian Pacific 23T is headed up by a CEFX AC44-9CW on the NS Chicago Line at CP-435. Description: NS 23T heads west on the Chicago Line at CP 435. Description: Eastbound intermodal. Trailing is CP 5965. Description: A bluebird leads a eastbound through Coakley Siding. Description: Even tho' the sun took the afternoon off, the colors still kinda' look right! Description: A pair of leasers head up this grain train tied down in downtown Calgary. Description: A pair of CEFX "Bluebirds" bring a CP manifest west as it comes through CP University. Description: Trailing at CP University behind another bluebird. Description: ...to make a dramatic image. 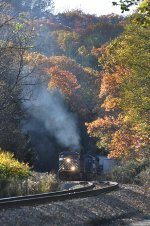 CP 253 blasts upgrade at Sanataria Springs late in the afternoon as the oak leaves change. Description: CEFX 1050 waits for it's next assignment. Title: Cefx 1050, CP's Tomah Sub. Description: CP Train 485, Cefx-1050, CN-5767.